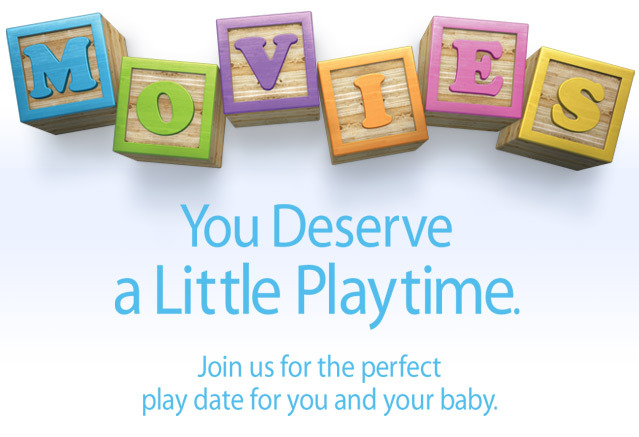 If you haven’t heard of Stars and Strollers, it’s basically a once a week occasion at the movie theatre where a few films – mostly chic flics – are available for viewing by parents with babies. Yesterday I finally coordinated with a friend, and Niko and I met up with Traci and Eli to watch Nine. I wasn’t sure how many parents would actually show up, but as soon as I pulled into the Silvercity parking lot I could see strollers being lifted out of cars and wheeled up the ramp toward the movie theatre, and once inside there were even more: it was like a stroller bonanza. After buying our tickets we headed into the theatre: now from what we understood you bring your stroller right in, but apparently this is a fire hazard so they made us park our strollers outside the door and then carry our babes in, in their carseats. This actually worked out fine, seeing as the carseats fit right into the theatre seats. The theatre wasn’t packed, but there were quite a few babies, and not too many super quiet moments during the movie: it was sort of like the babies provided a whole new soundtrack! I mean if it wasn’t Niko crying, it was Eli, and if it wasn’t Eli it was one of the other babies: each one seeming to take his or her turn during the two hour flic. But, regardless of the crying babes, it was still easy to hear the movie: it was focussing on the movie that proved to be more challenging seeing as diapers needed to be changed, as well as hunger pangs tended to. Would I do Stars and Strollers again? Yes. The good thing about a chic flic is that it’s usually pretty easy to zone in and out of, so when the baby needs some attention you can give it, without worrying about missing too much of the movie’s plot. Another bonus: the theatre sets up a change table filled with all the goodies needed to freshen up a dirty diaper! 4 Responses to "Stars and Strollers"
Although, why would I buy it, when I can hear it every day at home for free!